I got a size small for my 6-year-old son for the 4th of July and it fit him perfectly! He never complained that it was too big or uncomfortable or anything. He loved he design and so do I. We will definitely be buying more from 1776 United! Another great youth shirt, my son loves it. School recently started and this made the rotation on day two of the school year. 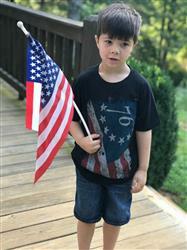 1776 United shirts at my son's go to every day he can wear them. Great quality and he knows they stand for something and he's proud to wear them!! All the youth shirts are great!!! my daughter loved her shirt, especially the historic flag design! great quality and after several washes (already) it still looks great!